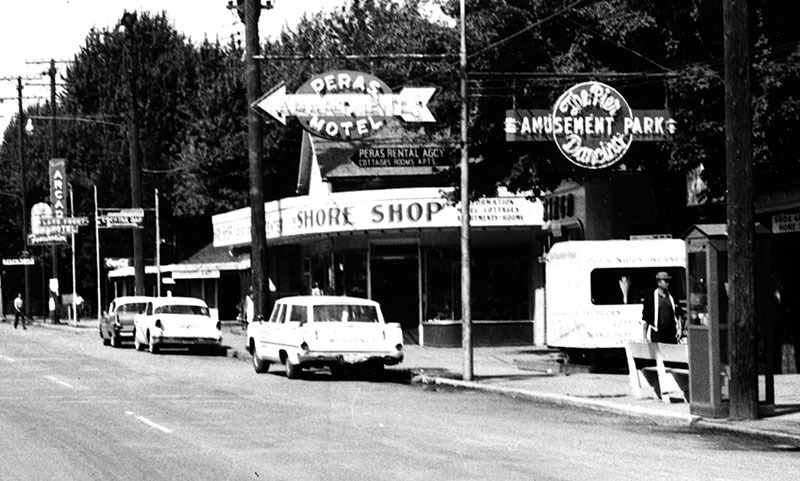 This 1958 photo of The Strip shows a sign pointing to Pera’s Arcade. Star Beacon archives. On July 10, 1952, fire destroyed the Sportland Penny Arcade, owned by E.M. Pera. The arcade was located on The Strip, in the area of Casino Gardens. Here is the account of the fire from the Geneva Free Press newspaper of July 11, 1952. Geneva-on-the-Lake today was still counting its luck as well as the cost of a roaring fire which destroyed the Sportland Penny Arcade Thursday night and threatened the entire business block. Only quick action on the part of Lake volunteers three other fire departments prevented the flames from lashing through the adjacent Casino Gardens. E.M. Pera, owner of the burned building, said last night that he could not estimate the total cost of the damage. However, it is believed the toll was well into thousands of dollars. Insurance adjustors were slated to survey the damage as soon as possible, Mr. Pera added. Thousands of spectators lined the south side of Lake Road to watch firemen combat the blaze that broke into an inferno within minutes. Volunteers were forced to divert their attention from the flaming penny arcade to pour gallons of water on the Casino Gardens to keep the fire from spreading. Extreme heat melted the telephones cable in front of the building and disrupted communication with Geneva. According to resort firemen an attempt was made to contact the Geneva Fire Department almost immediately after the alarm was sounded around 7:10 p.m. 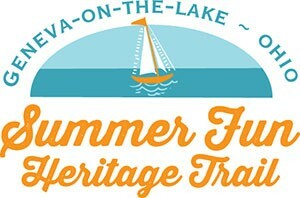 However, approximately 20 minutes lapsed before Geneva’s volunteers scramed toward the lake with the white village truck. Telephone Co. repair crews were still working at the fire scene this morning and a spokesman said service between Geneva and the resort village might be restored by noon. Low water pressure caused firemen to put an auxiliary pump on the beach to bring water up North Spencer Avenue to pour on the flames. He said he could see smoke in the building and he ran to the fire station to sound the alarm. By the time the fire truck had wheeled around the building was a mass of flames. Two employees and some three customers were in the buildinging escaped to safety. Trucks from Saybrook and Ashtabula, as well as Geneva and Geneva-On-The-Lake were used to battle the blaze. No one could estimate when caused the fire in what part of the frame structure it started. After the fire workers raked the ruins for coins, some of which melted beyond use. Drawers from cash registers were removed almost intact after the fire. The blaze lasted about two hours. It blistered and scorched the wall and roof of the Casino Gardens and some damage was seen at the nearby Pera home. The Pera Arcade was relocated in the former Casino ballroom after the Sportland Penny Arcade burned. Fire destroyed the 1915 dance hall in November 1979. Thirteen departments were called to the blaze. The loss was set at $700,000.